People from Ha Tinh province’s Loc Ha district, one of the worst affected by the marine environment disaster earlier this year, started getting compensation. The district’s compensation package is around 270 billion VND (9.3 million USD). The district government had approved the compensation package for damages as a result of a toxic spill caused by Hung Nghiep Formosa-Ha Tinh Steel Company. 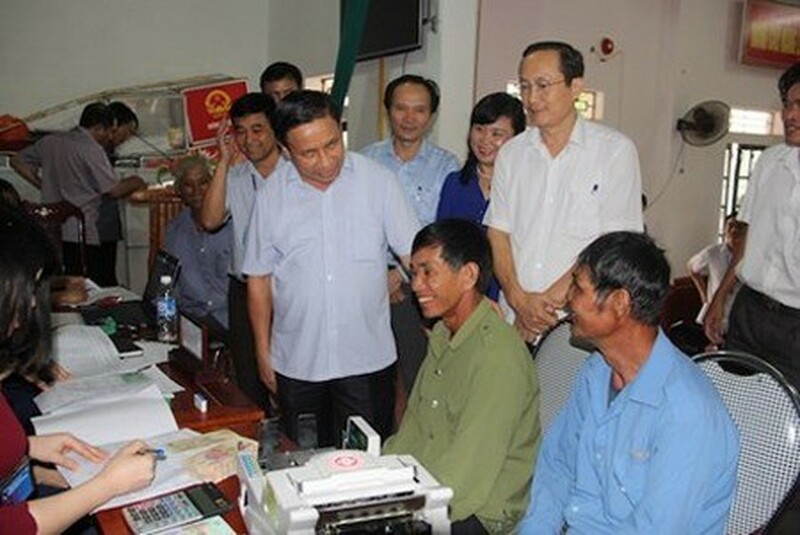 Loc Ha is the first district in Ha Tinh province to have started handing out compensation to affected people as part of the 500 million USD package that Formosa has pledged. Around 5,000 workers in the district have been directly affected by the pollution, while another 744 have been indirectly hit. Thinh Loc and Thach My communes in the district will be the first to receive compensation, to the tune of 20 billion VND (896,000 USD). On October 30, 15 vessel owners and 15 workers in Quang Trung village, Thinh Loc commune, got compensation worth 1.5 billion VND (67,200 USD). Payment will continue to be handed out to people in Loc Ha district in the following days. Ha Tinh’s provincial Party’s Committee secretary, Le Dinh Son, and Vice Chairman of the People’s Committee, Dang Ngoc Son, are overseeing the payment. “I hope people will overcome their difficulties and continue to use the ocean. It’s essential that people use their compensation appropriately. The management board in charge of compensation payment must make the process as easy as possible for those affected. It must check carefully and hand over aid to the right people,” Son said. As per the latest inventory (October 9), in Ha Tinh, around 7,000 fishing vessels, 2,260 hectares of ponds, lakes and tidal flats, 31,700 cubic metres of cage farming, 127 hectares of salt fields plus nearly 48,000 workers and fishermen have been affected by the toxic spill. Aquaculture products left in the storage stands at nearly 1,800 tonnes. The total damage to Ha Tinh is estimated at 2 trillion VND (89.6 million USD), of which 1.98 trillion VND is direct loss.